Canning Pickled Artichokes - Canning Homemade! Angela Carmen from my FB page had a super day last month of picking artichokes from The Farm, LLC with Candy Cross-Lyman and Jim Gregory...then, a full day of canning their bounty ~ 34 jars! The recipe for canning is a brine that you can use for the marinated red peppers or mushrooms and creates a oil/vinegar mixture that is approved for canning. Enjoy! Artichokes: freshly picked baby and small artichokes (preferably, picked and pickled on same day). You will need approximately 10-12 small chokes for each pint jar. 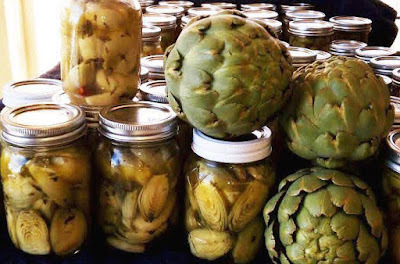 Note: we picked and pickled about 250-300 baby, small, and mid-size artichokes and filled 34 pints and 6 – ½ pints. Bring to a boil and then simmer to keep hot. This amount of brine made enough for approximately 8-9 pint jars. We made 4 batches of brine to finish all of our pints and 1/2 pints. Rinse all chokes in cold water to remove any bugs and dirt. Begin the deleafing (peeling) process; pick off the outer leaves until you reach the tender, light yellow/greenish leaves. Trim the bottom stem even with the base and trim the tips of leaves, if desired. Cut the chokes in 1/2 or 1/4's depending on size; the itty bitty baby chokes can be left whole. Place the trimmed chokes in a large bowl of acidulated water to retain color (use lemon juice or vinegar). Prepare jars, rings and lids per usual instructions. 1/4 to 1/2 teaspoon favorite dried herbs - we used dried oregano, basil and Trader Joe's "21 Seasoning Salute"
Stuff the jars tightly with prepared artichokes. Ladle and/or pour the hot brine over the chokes; pressing down all of the chokes firmly to remove air bubbles. 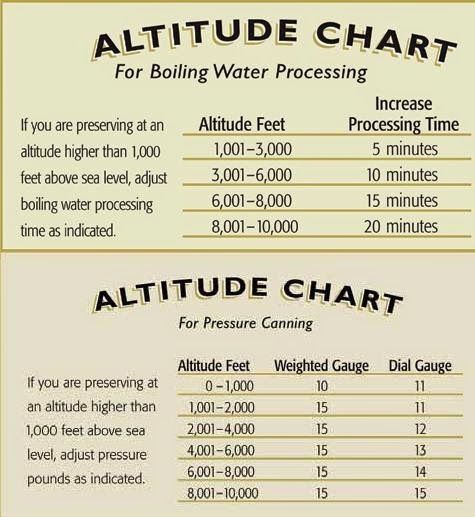 Top off the brine, if needed, and leave 1/2 inch of headspace. Clean the rim of jars before placing the lid and ring on the jar. Process jars for 30 minutes in water bath canner. From Angela: Note: these artichokes were so fresh and small that they did not have any hairy choke to clean. Artichokes were picked at “From the Farm”, Yuma, AZ; a u-pickers paradise (*_*). Larger artichokes were peeled and finely sliced (julienned) to use for salads and other recipes; using same brine, but adding no additional herbs or spices just the salt, garlic and dried chili. This mixture was packed into the ½ pint jars.